Smelly Carpet? Try These Easy Tips! Your carpet takes a beating throughout the day: sweaty feet, dirty shoes, spilled food, and pets, the list goes on. If the carpet fibers are not properly cleaned, all those memories will manifest in the most unpleasant of forms: different types of funky smell. So what can you do? Seeking professional help may be the best option. But before you take that step, here are some easy tips you can utilize to get that carpet smelling fresh and clean. Sometimes, it’s best to start with the basics. The baking soda and vacuum trick has been passed down for generations because it really does work. Generously sprinkle baking soda all over your carpet and leave it to sit overnight. The baking soda will absorb odors and excess moisture. Afterwards, give your carpet a thorough vacuuming. Many homeowners tend to do this on a regular basis to keep their carpet smelling fresh. We know what you’re thinking. “My carpet already smells, why would I pour vinegar on it?” Well, the great thing about vinegar is that its smell dissipates once it’s dry. Simply mix one part vinegar and two parts warm water into a spray bottle, spray on your carpet generously, and let it dry. The key here is to simply mist your carpet and not to pour the vinegar solution directly onto it. Pouring too much liquid onto your carpet could cause mildew to grow, making the problem even worse. Vodka is a great odor-neutralizer and stain-remover. You don’t necessarily have to dilute it with water like you would, the vinegar, but you’re also not going to be spraying it generously all over your carpet. You want to use this remedy for spot cleaning, such as stubborn stains. You may want to try this remedy in a hidden area first to ensure it won’t damage your carpet’s coloring. You can also try combining essential oils with any of the previous remedies for an extra fragrance boost. Additionally, some great smelling essential oils are also known for their cleansing properties, such as tea tree oil, peppermint oil, and lemon oil. If these natural remedies just aren’t cutting it, you can always try a chemical carpet cleaner from your local grocery store. 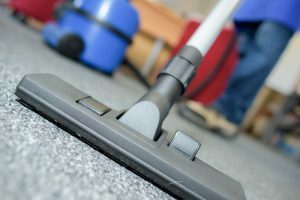 Vacuum your carpet thoroughly, and then scrub the recommended amount of cleaner into your carpet. Let it sit for about 20 minutes until dry and then vacuum your carpet again. If none of these options are working for you, you may need to seek out professional grade equipment. 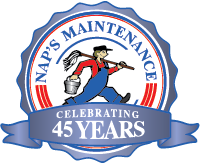 Naps Maintenance Service has been servicing clients for more than 45 years and would love to leave your carpet feeling soft and smelling fresh! While we’re there, we can also take care of all your cleaning needs, from hardwood flooring to windows. Give us a call today and see how fresh your carpet can be!